You will always remember the moment you find out you are pregnant. You remember where you were. You remember who you told first. You remember exactly how you felt, the emotional rush of that initial surprise. The moment you find out you are pregnant is etched into your memory forever, as it is one of the most if not THE most life changing days of your life. When you have been trying to get pregnant for nearly 5 years and you have exhausted all options- that moment, the moment you hear "YOU ARE PREGNANT" is an indescribable moment of joy. It finally happened. We are having a baby! And this moment, this life changing moment, happened to two of the most amazing people I know- Allison and Barry. Baby Lilikoi Borell is due to arrive on December 23, 2018- a true Christmas miracle, and these two are having a hard time hiding their excitement! 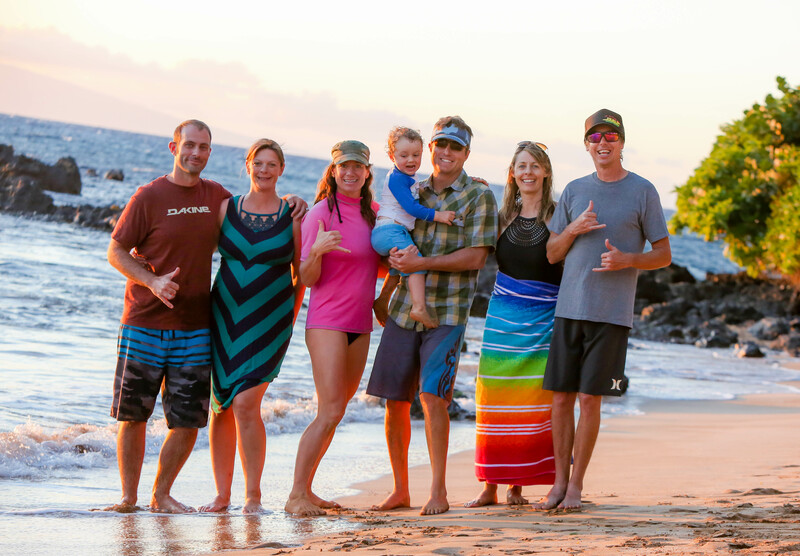 We met Allison in 2001, when we moved to Maui and began working together at an eco-adventure company. We clicked right away and a friendship started that has spanned nearly two decades. We met Barry in 2013 when we photographed their wedding on Maui. We knew right away that they were perfect for each other. Their wedding was spectacular. They had friends and family from all over the country come to their destination wedding in Upcountry Maui. Just as most events in Allison and Barry's life are, the celebration was full of smiles, jokes and endless laughter. These two were meant for each other. They have endless respect for one another. They are both extremely intelligent, hard working people... not to mention hysterical to be around. My belly usually aches from laughing after a visit with these two. About 5 years ago, shortly after they were married, they began trying to have a baby. Several years passed and still no baby. Their desire to have a child grew more intense and they began looking into options to help them get pregnant. In December of 2015, they started Intrauterine insemination (IUI). They did IUI 5 times without success. Each treatment came with extreme hope followed by deep disappointment- an emotional roller coaster. In March of 2017 they flew to Oahu to meet with a reproductive endocrinologist to discuss In Vitro Fertilization as the next option. They had their first (IVF) consultation in April of 2017 and began the process in June. IVF treatments are very invasive, time consuming, expensive and emotional experiences for anyone who goes through the process, not to mention painful. Take all of that emotion and do IVF on Maui and you can add 1000 more times the stress. All the appointments, ultrasounds, and procedures took place on Oahu, which meant they had to take a day off of work and fly to Honolulu. Get transportation to the hospital, get the treatment done, get transportation back to the airport, fly home, then drive home from the airport. Only part of the time did insurance cover Barry to join Allison. As you can imagine, you would want the support of your partner with such a procedure and such a taxing process with all of the travel. Over the course of the IVF treatment there were 10 plus visits to Oahu. In January of 2018, the final stage of IVF took place and the transfer was made. In mid February their hopes were crushed once again when they were told that IVF had failed. The pressure and the unsuccessful attempts of IUI and IVF took its toll. Exhausted from trying, in April 2018, they decided they were finished trying for awhile. It wasn't meant to be. After they came to this conclusion, a great relief came over them and they decided to celebrate with friends. They needed to just let loose and stop thinking about IVF, a baby, why it wasn't happening for them, why other people were getting pregnant and not them. They needed a moment of freedom. After a night of celebration, Allison wasn't feeling her usual self. She thought that she must have just had a little too much fun. But then the next day and the next day and the following day, she continued to feel ill. She thought to herself....could it be? Could I be pregnant? It had been a few months since their last IVF treatment, so it couldn't have been from that. And as it often happens, the moment you let go, the moment you decide it's ok, you are ok not having a baby, you get pregnant! And on that May day in 2018 Allison and Barry found out that they were going to be parents! They could hardly believe the results! After so many negative tests they had a difficult time grasping the reality of what they were seeing. It didn't even fully sink in until they saw their little one in the first ultrasound. A mixture of emotions followed as anyone who has ever been pregnant can attest to! They felt so blessed to receive such a jolt of good news when they least expected it after years and years of trying. The count down is on for Baby Lilikoi to arrive. All of the ups and downs these two experienced together will seem like a lifetime ago the moment they look into their precious little baby's eyes and hold her, kiss her and say 'I love you' for the first time. We are beyond excited for that moment for these two. It's the most magical moment in life. These two are going to crush it as parents! We had the pleasure of photographing their maternity photos on a white sandy beach on Maui. The photos truly captured their excitement for Baby Lilikoi and their love for each other! We had such a great time during the photo shoot! Our two year old son did as well and made a cameo in one of their parting shots. Below is the crew that helped and watched the maternity photo shoot take place. Like I always say, I love my job but on shoots like this one I LOOOOOOVVVVEEE my job! I feel fortunate that I get to call this work. I am already looking forward to photographing the Borells as a family! Contact us for all your photography needs! Sarah - I love this, tears of joy in my eyes for you two. Thank you Allison and Barry for letting your story be shared.